The first time, the beach of Agonda was mentioned to me, I sort of liked this beach name as it began with an A and ended with an A. Nice short name for a beach, AgondAhhhh. For many years the beach of Agonda was not even discovered, less even noticed even though it was screaming to be seen by the huge hoards of backpackers that flooded the crescent shaped bay beach of Palolem just on the other side of Palolem River. A decade ago, it was difficult to find tourists strolling along the white sands of Agonda. Today the entire scene has totally changed. With Palolem beach totally getting overcrowded and commercial, the immediate neighboring beach of Agonda is a great respite most needed for those tourists who love a serene place all to themselves. A decade ago, Agonda beach was like a best kept secret. Today Agonda beach is like a secret garden that is open and accessible to all beach lovers. Agonda Beach is the second in the list of preferences after Palolem beach who are enticed to the attractiveness of the large 3 kms beach, secrecy and empty beaches. In the responses of tourists it is highlighted that Agonda is for those who need peace and quiet, nice food, and decent housing at affordable prices. “Serene quiet beach away from the crowds. An ideal place for sun admirers and for those, who want to meditate or read a book” - this is Agonda for many now. The highly endangered Olive Riddley Turtles have blessed Agonda beach by choosing it to be their regular hatching site of their newly born baby turtles. Olive Riddley Turtles are observed to visit only two places One in Eastern India, at Orissa and the other in and one in Southern India at Goa. Agonda has a turtle nesting unit managed by Forests (wildlife) department of Goa. Agonda is the only beach where I came across many beach huts as being called as Coco Huts. Many of the beach accommodations that I visited during my stay at one of the local guest houses, I found that most of the beach huts or beach cottages owners prefer to call their accommodations as coco huts. This was something new and peculiar only with this South Goa beach of Agonda. Hand Made & Hand Built Herbal Coco Huts, Back to Nature at End of the Season. In South Goa, due to the regulations of the local government agencies called the Panchayat, not even a single person or private company is allowed to build permanent beach huts on beach region that comes under the designated area of CRZ or Coastal Regulation Zone. 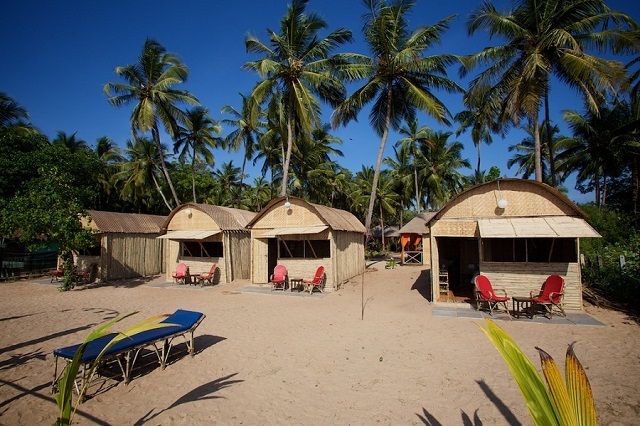 Hence all the Coco huts or beach huts at Agonda beach are natural, eco-friendly and dismountable in the Monsoon seasons. 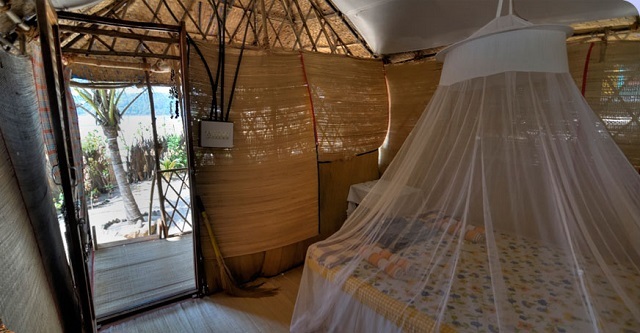 All the coco huts at Agonda beach are totally made from natural materials such as coir, wood, sticks, cane, palm leaves, bamboos, ropes and any other eco-friendly materials. Also every year in the month of May these temporary beach huts also called as coco huts of Secret Garden have to be compulsorily dismantled and the Agonda beach shoreline left back to its original state. Agonda beach leaves a definite imprint on the mind mainly because of its distinctive 3 bays that make up the entire stretch of Agonda beach. The most imprinted image of Agonda beach on my mind is the strewn rocks on the entire stretch of Agonda like sprinkled salt on my seafood platter.